Fermi says "nothing"...like sure sure? I wrote recently about a couple of theory groups who claim to have discovered intriguing signals in the gamma-ray data acquired by the Fermi satellite. The Fermi collaboration hastened to trash both these signals, visibly annoyed by pesky theorists meddling in their affairs. Therefore a status update is in order. Then I'll move to realizing the holy mission of yellow blogs, which is spreading wild rumors. The first of the theorist's claims concerned the gamma-ray excess from the galactic center, allegedly consistent with a 30 GeV dark matter particle annihilating into b-quark pairs. The relevant data are displayed on this plot released recently by Fermi, which shows the gamma-ray spectrum in the seven-by-seven degrees patch around the galactic center. There indeed seems to be an excess in the 2-4 GeV region. However, given the size of the error bars and of the systematic uncertainties, not to mention how badly we understand the astrophysical processes in the galactic center, one can safely say that there is nothing to be excited about for the moment. The status of the Fermi haze is far less clear. Here is the story so far. 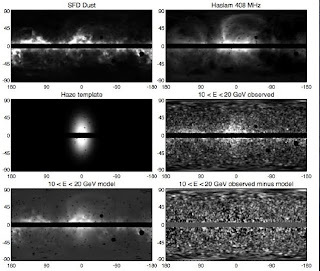 In a recent paper, Doug Finkbeiner and collaborators looked into the Fermi gamma-ray data and found an evidence for a population of very energetic electrons and positrons in the center of our galaxy. These electrons would emit gamma rays when colliding with starlight, in the process known as inverse Compton scattering. They would also emit microwave photons via synchrotron radiation, of which hints are present in the WMAP data. The high-energy electrons could plausibly be a sign of dark matter activity, and fit very well with the PAMELA positron excess, although one cannot exclude that they are produced by conventional astrophysical processes. But Fermi argues that there is no haze in their data. During the Fermi Symposium last week the collaboration was chanting anti-haze songs and tarred-and-feathered anyone humming Hazy shade of winter. Interestingly, it seems that each collaboration member has a slightly different reasons for doubts. Some say the haze is just heavy cosmic-ray elements faking gamma-ray photons. 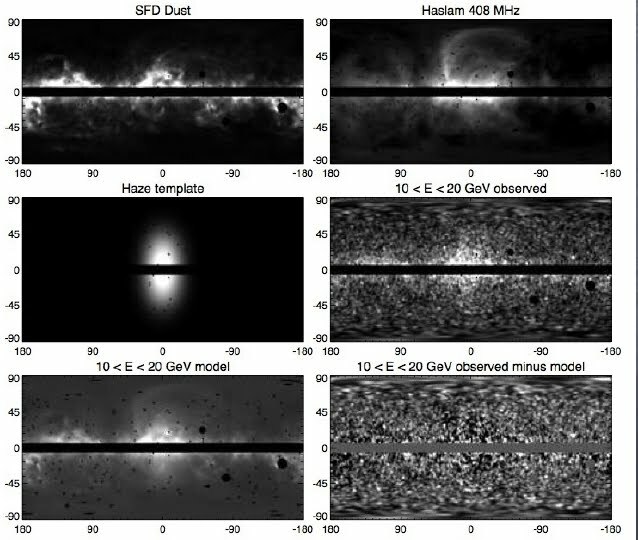 Some say the haze does exist but it can be easily explained by tuned-up galactic models without invoking an energetic population of electrons. Some say the haze is LOOP-1 - a nearby supernova remnant that happens to lie roughly in the direction of the galactic center. But none of the above explanations seems to be on a firm footing, and the jury is definitely out. In the worst case, the matter should be clarified by the Planck satellite (already up in the sky) who is going to make more accurate maps of photon emission at lower frequencies that will lead to a better understanding of astrophysical backgrounds. And now wild rumors... which, let's make it clear, are likely due to daydreaming over-imagination of data-hungry theorists. The rumors concern Fermi's search for subhalos, which is one of the most promising methods of detecting dark matter in the sky. Subhalos are dwarf galaxies orbiting our Milky Way who are made almost entirely of dark matter. Two dozens of subhalos have been discovered so far (by observing small clumps of stars that they host) but simulations predict several hundreds of these objects. The darkest of the discovered subhalos has a mass-to-light ratio larger than a thousand, indicating large concentration of dark matter. Because of that, one expects dark matter particles to efficiently annihilate and emit gamma rays (typically, via final state radiation or inverse Compton scattering of the annihilation products). Although the resulting gamma-ray flux is expected to be smaller than that from the galactic center, the subhalos with its small visible matter content offer a much cleaner environment to search for a signal. So, Fermi is searching for spatially extended object away from the galactic plane that steadily emit a lot of gamma rays but are not visible in other frequencies. The results based on 10-months data have been presented in this poster. Apparently, they found no less than four candidates at the 5-sigma level!!! However, according to the poster, these candidates do not fit the spectra of three random dark matter models. For this reason, the conclusion of the search is that no subhalos have been detected, even though it is not clear what astrophysical processes could produce the signal they have found. The hunt for the Higgs continues. Tevatron is running at full steam hoping to catch a glimpse of the sucker before the LHC joins in the game. If the standard model is correct, the entire range of allowed Higgs masses will be covered within next 3-4 years. But there is one disturbing puzzle: indirect measurement indicate that we should have already found the Higgs! Indeed, precision measurements at LEP and Tevatron - mostly lepton asymmetries of Z decay and the value of the W boson mass - are best explained if the Higgs mass is some 80-90 GeV, whereas the direct limit from LEP implies that it must be heavier than 115 GeV. There is one more reason, this time purely theoretical, to expect that the Higgs may be lighter than the naive LEP bound. If supersymmetry is relevant at the weak scale it is in general very uncomfortable with a heavy Higgs. Well, they keep telling you that the upper limit in the MSSM is 130 GeV. But that requires stretching the parameters of the model to the point of breaking, while the natural prediction is 90-100 GeV. Indeed, not finding the Higgs at LEP is probably the primary reason to disbelieve that supersymmetry is relevant at low energies. 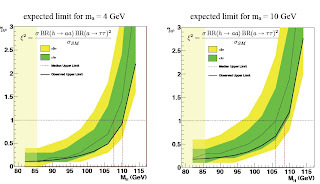 Is it possible that Higgs is lighter than 115 GeV and LEP missed it? The answer is yes, because the LEP searches have left many loopholes. Sensitivity of LEP analyses deteriorates if the Higgs decays into a many-body final state, which is possible in some extensions of the standard model. One popular theory where this could happen is the NMSSM - the 2.0 version of the MSSM with an additional singlet. Roughly, the Higgs could first decay into the new singlet, who in turn decays into two tau leptons, which amounts to Higgs decaying into four tau leptons. This funny decay topology could escape LEP searches even if the Higgs is as light as 86 GeV! That is the case not because of deep physical reasons, but simply because LEP collaborations were too lazy to search for it (in comparison, Higgs decaying into four b-quarks, which was studied by LEP, is excluded for the Higgs mass up to 110 GeV). But not anymore - this particular gaping hole has been recently sealed. A group of brave adventure-seekers ventured into CERN caverns, excavated the ancient LEP data and analyzed them lookig for the Higgs-to-4tau signal. The results were presented this week at the ALEPH meeting celebrating the 20th anniversary and 9th anniversary of its demise. Of course, there is nothing there, in case you had any doubts. The new limit for the Higgs-to-4tau channel excludes the Higgs mass smaller than 105-110 GeV. Yet the beautiful thing in that analysis is that going back to the LEP data is still possible, if only there is reason, and will, and cheap work force.